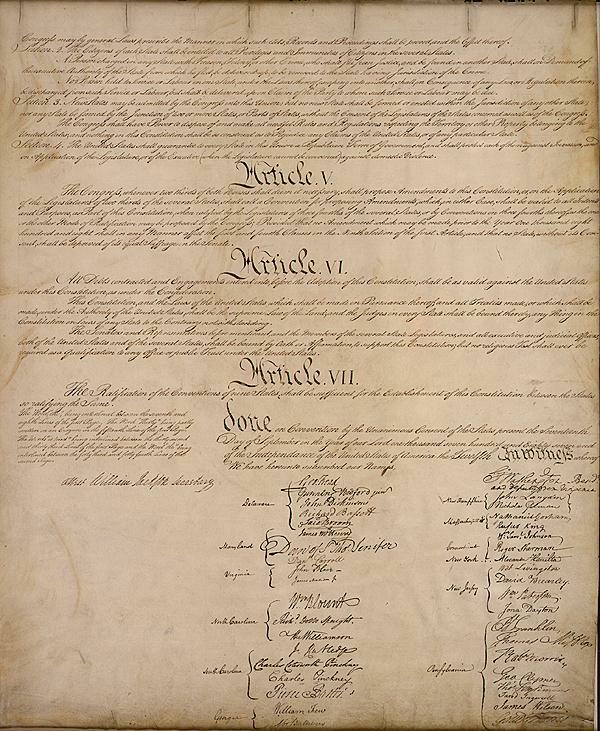 This page is one of the answer pages for the USConstitution.net's Constitutional FAQ. There have been so many questions and answers over the years, that it was best to split them among several files. If you're looking for the question list, you can find it in three places. First, the original, with questions listed in more- or-less the order I was asked them; next, the subject listing, with questions listed by general topics; and lastly, the Constitutional listing, with questions listed in the order they relate to the Constitution itself. Q101. "Exactly where in the Constitution does it say that the President and Vice President cannot be from the same state? In the 12th amendment the wording leads me to think that the electors and the candidates cannot be from the same state." A. The Constitution doesn't say that they cannot be from the same state. However, the 12th Amendment does say that electors may not vote for a President from their state and a Vice President also from their state. This issue came up in the 2000 presidential campaign when Texas Governor George W. Bush chose fellow Texas resident Richard Cheney to be his running mate. Cheney, who had served in Congress as a Representative from Wyoming, quickly changed his legal residence back to Wyoming to avoid the possible conflict for electors from Texas. Court challenges to Cheney's change of residency were denied. It is unlikely that two people from the same state would ever be nominated by a major political party. It is constitutionally possible however. If it ever came to pass, the party that won the ticket's state would likely suggest to the electors that their votes for the President go to the presidential nominee and that the votes for the Vice President be given in honor of a party official. Electors in all other states, as mentioned above, would be free to vote for both of the party's nominees. Q102. "Much controversy is being made over the First Amendment and religion especially in recent years. Were all the men who wrote and signed the Constitution and the Bill of Rights Christians? If not what other religions were there represented by this group of men?" A. The first thing to remember is that the Bill of Rights was not written by the Framers of the Constitution. It was drafted by James Madison, and then edited and finalized by Congress. I cannot tell you the religious affiliations of all of the members of that Congress. I can say, however, that all of the Framers were either Christian or Deist. Most were Protestant of one denomination or another. Daniel Carroll and Thomas Fitzsimons were Roman Catholics. See the Framers Demographics Page for more information on the Framers. Q103. "I have heard that the U.S. Constitution is based on a document called the 'Iroquois Confederation'. Is this true, and if so what parts of the Constitution came from this document?" A. The U.S. Constitution is not based on that of the Iroquois Confederation - but some of the delegates to the Convention knew of the Confederation (notably Benjamin Franklin) and the two documents share many concepts, as do many constitutions. The Five Nations was a federal-style system, and it shared that with the U.S. You can find it online, though it is slightly difficult reading - the Indians spoke often in concept and metaphor. I found a copy here: The Tuscarora and Six Nations Website. Q104. "On what day does the electoral college meet to cast their votes? I have heard early January, but I have also heard December." A. By law it is in December: "The electors ... shall meet and give their votes on the first Monday after the second Wednesday in December..." This is found in the U.S. Code, 3 USC 7. Q105. "My local newspaper had an educational page about voting that showed all the things that had been decided by one vote. For example, it said that German was almost the official language of the U.S., losing by just one vote, and the Rutherford Hayes was elected President by just one vote. Are these things true?" A. Hayes was, indeed, elected to the Presidency by just one vote ... but not by a single vote in the popular election. The U.S. uses a system called The Electoral College to technically choose the President. In 1876, Hayes got 185 votes in the Electoral College, and Samuel Tilden got 184. So, he did win by one vote. The German language thing, however, is an urban legend, helped along, unfortunately, by popular newspaper columnist Ann Landers. The story, like so many myths, is based on truth, but has been twisted and stretched to today's "German but for one vote" story. It is unfortunate the newspaper used this example. In 1795, a vote in the Congress came up to decide whether to print the US Code in German as well as in English. During the debate, there was a motion to adjourn, which failed by one vote, but there is no record of the official vote on the final measure. The full story can be found here. While researching this Answer, I found another page that refutes several other "one vote" stories, including that Oliver Cromwell was given control of England in 1645 by one vote and that Adolf Hitler was made leader of Germany's Nazi Party in 1923 by one vote. The page can be found at Snopes.com, a site with lots of other debunking of urban legends. The fact that many of these stories are not true should not have any effect on your use of your suffrage right. The ability to vote is something people in other nations die for ... do not take it for granted. Q106. "I am unaware of the status of the Articles of Confederation, but for the sake of argument, if my some outside chance Canada formally asked to become part of the union, would the United States have to honor it's commitment under Article XI? Or is the article null and void at this point in our history?" A. Under the Articles of Confederation's Article XI, the United States made an open invitation to Canada to join the new union as a state, admission guaranteed simply by asking. If Canada had made such a request, the world would be a much different place today. The open invitation, however, expired with the replacement of the Articles with the Constitution. Canada is free to request admission into the United States, as is any independent nation, territory of the United States, or other political unit, under the rules laid out in Article 4, Section 3 of the Constitution. Q107. "Where does the C.I.A. get their power and authority?" A. The CIA, and a whole host of other government agencies, fall under the Executive Branch. Their power, then, comes from the power of the President. The job of the executive branch is to carry out the legal authority given to it by the Legislative Branch, the Congress. So the power and authority of the CIA comes from the legislation authorizing the creation and funding of the CIA, from the powers delegated to it by the President and/or the Congress, and from the prestige and respect of the agency by other parts of the government. The same applies to every executive department or agency. From the FAA's power to regulate the skies over the United States to HUD's ability to regulate housing standards, the power comes from the people in the form of the Congress. Congress can curtail the acts of an agency at any time with appropriate legislation (though once an agency is established, it can be hard to disband; and once a power is given, it can be hard to take it away). The question also begs another: why do we even need agencies like the EPA, the FBI, or the FDA? The following quote from Constitutional Law: Cases and Commentary by Daniel Hall says it quite well: "... the job of governing has become too large for Congress, the courts, and the President to handle... Congress does not have time to make all the laws, the President to enforce all the laws, or the courts to adjudicate all the cases... Congress is too small to be an expert in every subject. Agencies, however, specialize and, as a result, they possess technical knowledge and expertise in their subject areas." Q108. "Who has the power to declare war?" A. There is a short answer and a much longer answer. The short answer is that the Constitution clearly grants the Congress the power to declare war, in Article 1, Section 8. This power is not shared with anyone, including the President. The President, however, is just as clearly made the Commander in Chief of all of the armed forces, in Article 2, Section 2. In this role, the President has the ability to defend the nation or to take military action without involving the Congress directly, and the President's role as "C-in-C" is often part of the reason for that. What this has resulted in is the essential ability of the President to order forces into hostilities to repel invasion or counter an attack, without a formal declaration of war. The conduct of war is the domain of the President. These two distinct roles, that of the Congress and that of the President, bring up the interesting and important questions: can the United States be "at war" without a declaration of war? If we can, then what is the point of a declaration? If not, then what do we call hostilities without a formal declaration? The question of the need for a declaration of war dates all the way back to the presidency of Thomas Jefferson. Jefferson sent a squadron of warships to the Mediterranean to protect U.S. shipping against the forces of the Bey of Tripoli. Jefferson's instructions to the squadron were that they act in a defensive manner only, with a strictly defined order of battle. When a Tripolitan cruiser shot at a U.S. ship, the U.S. forces seized the ship, disarmed it, and released it. Jefferson's message to Congress on the incident indicated that he felt the acts to be within constitutional bounds. Alexander Hamilton wrote to Congress and espoused his belief that since the United States did not start the conflict, the United States was in a state of war, and no formal declaration was needed to conduct war actions. Congress authorized Jefferson's acts without declaring war on the Bey. Not all acts of war, however, need place the United States into a state of war. It is without doubt an act of war to fire upon a warship of another nation. In 1967, during the Six Day War, Israel attacked the USS Liberty, an intelligence ship operating off the Sinai coast. But the United States did not react as though it were at war, even though many considered the attack deliberate (both Israel and the U.S. later determined the attack to have been a mistake caused by the cloud of war). It may be correct to say, then, that an act or war committed against the United States can place the United States into a state of war, if the United States wishes to see the act in that light. A declaration of war by the Congress places the Unites States at war without any doubt. Absent a declaration of war, the President can react to acts of war in an expedient fashion as he sees fit. Q109. "Why did Rhode Island not send delegates to the Constitutional Convention?" A. Rhode Island was afraid that any new system proposed by the convention would be detrimental to its economy. Rhode Island issued lots of paper money, and one of the aims of the convention, in the opinion of Rhode Islanders, was to nationalize the currency (which, in fact, happened). Rhode Islanders were also famous for (perhaps infamous for) their sense of independence and suspicious of the calls for a stronger national government. The state was not looked upon favorably by others, often being referred to as Rogue Island. Despite her failure to send delegates, it was assumed that Rhode Island would relent and ratify the Constitution, and a copy of the finished document was forwarded to the state as it was to every state. Initially, Rhode Island rejected the Constitution, but the reality of trying to go it alone as a sovereign nation, surrounded by a large and populous United States, finally convinced Rhode Island to ratify. The final vote was close, 34 in favor, 32 opposed. See Rhode Island History for more information on Rhode Island. Q110. "Does the President have the authority to cancel the 1972 ABM treaty without the advise and consent of the senate? The power is given to the President to make treaties with the advise and consent of the Senate. I would think he does not have unilateral power to void a treaty." A. There is some debate on the answer to this question, mostly because just about every conceivable route has been taken. The Constitution does not address the issue directly, so the question is, can we infer what the Constitution would say about breaking treaties? The first argument is in your question - that the President makes treaties, but the Senate must ratify them, so it must be that both the Senate and the President must agree to break the treaty. However, the President is head of state, and as such has responsibility for conducting foreign relations, and should have the ability alone. Lastly, since breaking a treaty can cause a major international incident, and even result in war, a final argument says that Congress as a whole must request the breaking of a treaty. All of these methods have been used. Congress has unilaterally broken treaties, the President has unilaterally broken treaties, the Senate and the President have joined forces to break treaties, and the Congress has requested that the President break treaties - and in some cases, the President has refused. The safest way, meaning the way least likely to be challenged in court, is for the President and Congress to agree that a treaty needs to be broken and to do it together. Any other way invites controversy, though often times such controversy is unavoidable. For a comprehensive look at how treaties have been broken over the centuries, refer to the Government Printing Office's page on The Executive, and look for "Termination of Treaties by Notice." Q111. "OK, I read the answer to Question 25 but I'm confused because of all the talk of military tribunals and loss of rights for terrorists caught in Afghanistan. What's the deal?" A. Your question is a the heart of many of the concerns of civil libertarians, who see the government's announced use of military tribunals hard to swallow, and frightening in their use. The biggest difference, though, between Louise Woodward and terrorists caught in Afghanistan is that the United States is saying that the latter are combatants in a war, whereas the former was a young woman charged with a criminal matter. Woodward was alleged to have committed the act in the United States, was arrested in the United States, and was, ultimately, tried in the United States. She was also acquitted (by the judge). The terrorists are being tracked down for crimes committed or just contemplated, to be done in the United States or elsewhere, and are being caught and detained outside the United States. Though there are similarities, the two classes of people (foreigners who commit crimes in the U.S. and terrorists engaged in planning or carrying out terrorist acts) are totally different. Q112. "If titles of nobility are prohibited by the constitution, why then does the U.S. Supreme Court bestow the title of 'honorable' to the judges that at seated there? For that matter, why do we refer to any Judge as 'your honor'?" The Supreme Court has no authority to grant any title. The terms "honorable" and "your honor" are not titles of nobility, and are not limited to judges. Some mayors are also referred to this way, as are other officeholders. (It does vary among localities.) These are mere honorifics used only while the individual holds the office, and sometimes are not used (if at all) outside of the individual's formal functions of that office. With a title of nobility, a person retains the title for his lifetime, is referred to in all social situations by the title, and passes the title on to heirs. The title and privilege extend to all situations and it (along with the system of nobility and royalty) is an integral part of the society. Q113. "What is the right to privacy and where can I find it in the Constitution?" A. The right to privacy is not a part of the Constitution, at least not in so many words. The right to privacy would best be seen in the 9th Amendment, which basically says that just because a right is not in the Constitution, does not necessarily mean that it does not exist. The justices of the Supreme Court, in several cases over the past half century, have found that a right to privacy does exist in the Constitution, to a degree. The cases that started the process of the "finding" of this new right began with cases like Loving v Virginia, where it was ruled that the state cannot prevent mixed-race marriages; and like Griswold v Connecticut, where it was ruled that a state cannot prevent a married couple from buying and using condoms. The first mention of a right to privacy was in a dissenting opinion in Olmstead v US in 1928, in which Justice Brandeis argued that the Framers had created a framework for the greatest right of all: "the right to be left alone." The Supreme Court has found that this right to privacy appears in the Constitution in several pre-existing forms. For example, the police are not allowed to search your home or papers without a warrant, which is a direct protection of privacy. The majority of the justices found a right to privacy in some form, a right which could be expanded. Some justices argued that since there is no right to privacy directly enumerated in the Constitution, such a right does not exist. With all due respect, however, this is exactly the sort of argument that the 9th was designed to counter. The right is far from absolute, and many invasions of privacy, such as drug tests and the census, have been upheld by the Supreme Court. Q114. "I always thought that treason was the only crime defined in the Constitution, but a friend of mine insists it is not, though he refuses to say what the others are. Can you help?" A. Sounds like your friend isn't being as forthcoming as you would think a friend would be. However, I think that your friend is confusing "definition" with "mention." It is certainly true that treason is the only crime that has its minimum standard set in the Constitution itself, in Article 3, Section 3. There, treason is defined and the standard for conviction is set. No other crime is treated so thoroughly. However, Article 1, Section 8, Clause 6 specifically mentions counterfeiting, which may be what your friend is thinking of. Other clauses in that section mention much more nebulous crimes, such as "Piracies and Felonies committed on the high Seas" and the like. Q115. "What is the impeachment process?" A. The Constitution details impeachment in Article 1, Section 2, Article 1, Section 3, Article 2, Section 3, and Article 3, Section 2. The word "details," however, is a bit strong for what the Constitution provides. As with many things, the Constitution primarily gives us a skeleton of a process. The House brings charges for impeachment. The Senate holds a trial and votes to convict or acquit. The only way to remove a President or Vice President is through impeachment. Impeachments are not tried by a jury. The rest of the process is left open. The process begins with the House. It votes on passing articles of impeachment against a member of the Executive or Judicial branches. If the articles pass, then it is said that the person has been impeached. The vote is a straight up-or-down, majority vote. After the House votes, the impeachment goes to the Senate. There, members of the House who were advocates for impeachment become the prosecutors in the Senate trial (they are called the House Managers). The accused secures his own counsel. The judge is the Senate itself, though the presiding officer acts as the head judge. In the case of a presidential impeachment, the Chief Justice of the Supreme Court presides; in other cases, the Vice President or President Pro Tem presides. After all testimony has been heard, the Senate votes. If the Senate votes to convict by more than a two-thirds majority, the person is impeached. The person convicted is removed from office. The Senate may also prevent that person from ever holding another elective office. The Senate may set its own rules for impeachments, and the rules are not subject to judicial review. The Senate has streamlined rules for trial of impeachment for persons holding lower offices. There is no appeal in the case of conviction of impeachment. During the threat of impeachment of President Nixon, Charles Black wrote a book called Impeachment which details the process even further. Q116. "I am wondering who actually was the first to sign the Constitution and when was it signed?" A. The answer to the second question can be found quite easily by checking the Constitution itself. The answer to the first question is actually a little harder to determine. An image of the last page shows the signatures of the conventioneers, and though that of George Washington is at the top, that does not mean that he signed first. He signed his name as "President and deputy from Virginia," so maybe he signed when the others from Virginia signed. The signature of William Jackson, the secretary of the convention, is also prominent. That of George Read is first in the left hand column, and John Langdon is first in the right hand column. The point is, looking at the document is not the best way to determine who signed first. The best secondary source of information would be the Minutes taken by James Madison. But Madison's notes on this day, on this particular issue, are scant: "The members then proceeded to sign the instrument." The next best source would be other papers or letters written by anyone at the Convention. Unfortunately, I do not have access to great resources in this area. I would call on anyone with such access to let me know if my final conclusion is rendered incorrect by any such paper. The last source of information is books about the Convention. There are many, of which I have a few. After consulting with them, some merely parrot Madison's words, some note that the delegates signed in order of state, and one notes that Washington signed first. The authors of these books that did not state one way or the other are all correct, and the one that states that Washington signed first is providing an opinion based on reasonable deduction. Using some reasonable deductions of my own, I've concluded that Washington signed first. The fact that his signature is at the top of the lists of names is one particularly telling fact. The respect that the conventioneers had for Washington as both a person and as the president of the convention is another indication that he would have been asked or have been expected to sign first. It is reasonable, then, to say with as much certainty as possible, that George Washington signed the Constitution first. Q117. "How did the President's Cabinet get its name?" A. Like many parts of the American political system, the idea of a cabinet was borrowed from Great Britain. Hundreds of years ago, the word cabinet referred to a small room, no bigger than a cabinet, that was located near the private rooms of the king or queen. The monarch's advisors would be brought to the cabinet for confidential discussions about the empire. The most trusted advisors visited the cabinet most often. They came to be called the cabinet counsel, or simply, the cabinet (source). Q118. "I remember reading that if the citizens are unhappy with the way the Government is running the country they can choose to, I don't know how to put it but, basically remove all members & then reoccupy with newly appointed members. I've been reading the site for a little over an hour and haven't found anything hinting towards this." A. The notion is built into the regular elections that we have. Within six years, all of the elected members of the government can be rotated out. The entire House of Representatives is reelected every two years; the President and Vice President (and hence the Cabinet) every four years, and one third of the Senate every two years. If there was a concerted effort to replace the members of the government, starting now, we could have a new House, one third of a new Senate, and a new President at the beginning of 2005. In 2007, two-thirds of the Senate, and by 2009, a whole new Senate. The judiciary is harder, since they serve for life. That's the constitutional means. The Constitution is based on the assent of the governed. If the governed, the people, decide to replace the Constitution, that is certainly possible at any time. Q119. "'Lost Cause' revisionists claim that the Fourteenth Amendment was a hatchet-job, illegally passed, and, therefore, quite unconstitutional. Can you help me answer this charge?" A. Lots of people, for whatever reason (Lost Cause supporters or not) think that the 14th was illegally passed. The surest answer to the charge is that the amendment could have been challenged any time since 1868, and was not. The admitted blackmail that the United States exerted on the former Confederate states to ratify the 14th may have been questionable, but it is undeniable that the states all ratified it. There is also nothing in the Constitution that says that states or the federal government cannot exert pressure on another state to ratify an amendment. Again, the tactics may have been questionable in several cases, but not unconstitutional. One argument is that some states rescinded ratification after they ratified and before full ratification. This has been the subject of some debate, but there has been a general constitutional argument that once a state ratifies an amendment, it cannot be unratified. Some focus on Ohio and New Jersey, which rescinded prior to July 9, 1868, the official date of ratification. However, Alabama, Georgia, and Virginia all ratified within a few months - even if these rescissions counted, which is debatable, the ratifications by Alabama and Georgia would have been enough to meet the requirement. The latest, then, the amendment could have been seen as ratified is July 21, 1868 instead of July 9, 1868. Of course, at the time, the rescissions of the Ohio and New Jersey were noted, and rejected as invalid. The Secretary of State and Congress of the time listed both as having ratified and were included in the list of ratifying states. Now, these facts may not bolster your argument, but they do give you information that the other side will probably try to use. The other key point to note is that the Supreme Court has had, literally, hundreds of opportunities since 1868 to rule that the 14th is not a valid amendment but, indeed, it has used the 14th to greatly expand the protections of the people from government intrusion on civil rights. Q120. "Since it is true that the president must be a naturally born citizen, does the vice president also have to be a naturally born citizen?" A. The Vice President has the same qualifications as the President - if you cannot be President, you also cannot be Vice President. This is specified in the last sentence of the 12th Amendment. © 1995-2010 by Steve Mount. All rights reserved. 2019 usconstitution.net. All rights reserved.